Many languages are used, or historically have been used in the United States. The most commonly used language is English. There are also many languages indigenous to North America or to U.S. states or holdings in the Pacific region. Languages brought to the country by colonists or immigrants from Europe, Asia, or other parts of the world make up a large portion of the languages currently used; several languages, including creoles and sign languages, have also developed in the United States. Approximately 337 languages are spoken or signed by the population, of which 176 are indigenous to the area. Fifty-two languages formerly spoken in the country's territory are now extinct. The most common language in the United States is known as American English. English is the de facto national language of the United States; in 2007, 80% of the population solely spoke it, and some 95% claimed to speak it "well" or "very well". However, no official language exists at the federal level. There have been several proposals to make English the national language in amendments to immigration reform bills, but none of these bills has become law with the amendment intact. The situation is quite varied at the state and territorial levels, with some states mirroring the federal policy of adopting no official language in a de jure capacity, others adopting English alone, others officially adopting English as well as local languages, and still others adopting a policy of de facto bilingualism. Since the 1965 Immigration Act, Spanish is the second most common language in the country, and is spoken by approximately 35 million people. The United States holds the world's fifth largest Spanish-speaking population, outnumbered only by Mexico, Spain, Colombia, and Argentina. Throughout the Southwestern United States, long-established Spanish-speaking communities coexist with large numbers of more recent Hispanophone immigrants. Although many new Latin American immigrants are less than fluent in English, nearly all second-generation Hispanic Americans speak English fluently, while only about half still speak Spanish. According to the 2000 US census, people of German ancestry make up the largest single ethnic group in the United States, and the German language ranks fifth. Italian, Polish, and French are still widely spoken among populations descending from immigrants from those countries in the early 20th century, but the use of these languages is dwindling as the older generations die. Russian is also spoken by immigrant populations. Tagalog and Vietnamese have over one million speakers each in the United States, almost entirely within recent immigrant populations. Both languages, along with the varieties of the Chinese language, Japanese, and Korean, are now used in elections in Alaska, California, Hawaii, Illinois, New York, Texas, and Washington. Native American languages are spoken in smaller pockets of the country, but these populations are decreasing, and the languages are almost never widely used outside of reservations. Hawaiian, although having few native speakers, is an official language along with English at the state level in Hawaii. The state government of Louisiana offers services and documents in French, as does New Mexico in Spanish. Besides English, Spanish, French, German, Navajo and other Native American languages, all other languages are usually learned from immigrant ancestors that came after the time of independence or learned through some form of education. Additionally, modern estimates indicate that American Sign Language was signed by as many as 500,000 Americans, as of 1972--the last official survey . . . this would project to a number between 860,000 and 900,000 users currently. (Although various cultural factors, such as passage of the Americans with Disabilities Act, have resulted in far greater educational opportunities for deaf children, which could double or triple the number of current ASL users.). The total sample size for these figures is 286 million people. As part of what has been called the English-only movement, some states have adopted legislation granting official status to English. As of October 2014, out of 50 states, 31 had established English as the official language, and Hawaii had established both English and Hawaiian as official. In 2014, three more states, Pennsylvania, New York, and New Jersey, considered enacting English as their official state language. Louisiana Yes No since 1811. French has had special status since 1968 founding of CODOFIL. In New Mexico, although the state constitution does not specify an official language, laws are published in English and Spanish, and government materials and services are legally required (by Act) to be made accessible to speakers of both languages. According to the 2000 Census and other language surveys, the largest Native American language-speaking community by far is the Navajo. Navajo is an Athabascan language with 178,000 speakers, primarily in the states of Arizona, New Mexico and Utah, in addition to smaller numbers of speakers across the country. Dakota is a Siouan language with 18,000 speakers in the US alone (22,000 including speakers in Canada), not counting 6,000 speakers of the closely related Lakota. Most speakers live in the states of North Dakota and South Dakota. Central Alaskan Yup'ik is an Eskimo-Aleut language with 16,000 speakers, most of whom live in Alaska. Cherokee belongs to the Iroquoian language family, and had about 22,000 speakers as of 2005. The Cherokee have the largest tribal affiliation in the U.S., but most are of mixed ancestry and do not speak the language. Recent efforts to preserve and increase the Cherokee language in Oklahoma and the Cherokee Indian reservation in North Carolina have been productive. Western Apache, with 12,500 speakers, is a Southern Athabaskan language closely related to Navajo, but not mutually intelligible with it. Most speakers live in Arizona. The O'odham language, spoken by the Pima and the Tohono O'odham, is a Uto-Aztecan language with more than 12,000 speakers, most of whom live in central and southern Arizona and northern Sonora. Choctaw has 11,000 speakers. One of the Muskogean language family, like Seminole and Alabama. Keres has 11,000 speakers. A language isolate, the Keres are the largest of the Pueblo nations. The Keres pueblo of Acoma is the oldest continually inhabited community in the United States. Zuni has 10,000 speakers. Zuni is a language isolate mostly spoken in a single pueblo, Zuni, the largest in the U.S. Ojibwe has 7,000 speakers (about 55,000 including speakers in Canada). The Algonquian language family includes populous languages like Cree in Canada. Since the languages in the Americas have a history stretching for about 17,000 to 12,000 years, current knowledge of American languages is limited. There are doubtless a number of languages that were spoken in the Americas that are missing from historical record. A sign-language trade pidgin, known as Plains Indian Sign Language or Plains Standard, arose among the Plains Indians. Each signing nation had a separate signed version of their oral language, that was used by the hearing, and these were not mutually intelligible. Plains Standard was used to communicate between these nations. It seems to have started in Texas and then spread north, through the Great Plains, as far as British Columbia. There are still a few users today, especially among the Crow, Cheyenne, and Arapaho. Unlike other sign languages developed by hearing people, it shares the spatial grammar of deaf sign languages. From the mid-19th century on, the nation had large numbers of immigrants who spoke little or no English, and throughout the country state laws, constitutions, and legislative proceedings appeared in the languages of politically important immigrant groups. There have been bilingual schools and local newspapers in such languages as German, Ukrainian, Hungarian, Irish, Italian, Norwegian, Greek, Polish, Swedish, Romanian, Czech, Japanese, Yiddish, Hebrew, Lithuanian, Welsh, Cantonese, Bulgarian, Dutch, Portuguese and others, despite opposing English-only laws that, for example, illegalized church services, telephone conversations, and even conversations in the street or on railway platforms in any language other than English, until the first of these laws was ruled unconstitutional in 1923 (Meyer v. Nebraska). 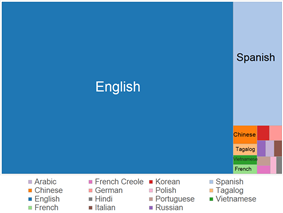 Currently, Asian languages account for the majority of languages spoken in immigrant communities: Korean, the varieties of Chinese, and various Indian or South Asian languages like Punjabi, Hindi/Urdu, Kannada, Gujarati, Marathi, Bengali, Tamil, Telugu and Malayalam, as well as Arabic, Vietnamese, Tagalog, Persian, and others. English was inherited from British colonization, and it is spoken by the majority of the population. It serves as the de facto official language, the language in which government business is carried out. According to the U.S. Census Bureau 80% spoke only English at Home and all but 57,097,826 of U.S. residents speak English "well" or "very well". American English is different from British English in terms of spelling (a classic example being the dropped "u" in words such as color/colour), grammar, vocabulary, pronunciation, and slang usage. The differences are not usually a barrier to effective communication between an American English and a British English speaker, but there are certainly enough differences to cause occasional misunderstandings, usually surrounding slang or region dialect differences. Spanish was also inherited from colonization and is sanctioned as official in the territory of Puerto Rico. Spanish is also taught in various regions as a second language, especially in areas with large Hispanic populations such as the Southwestern United States along the border with Mexico, as well as Florida, parts of California, the District of Columbia, Illinois, New Jersey, and New York. 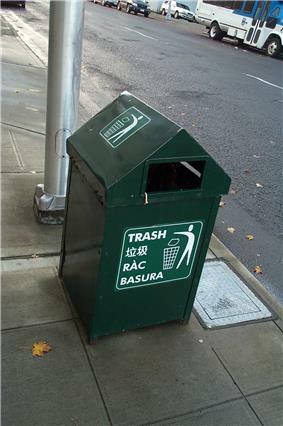 In Hispanic communities across the country, bilingual signs in both Spanish and English may be quite common. Furthermore, numerous neighborhoods exist (such as Washington Heights in New York City or Little Havana in Miami) in which entire city blocks will have only Spanish language signs and Spanish-speaking people. In addition to Spanish-speaking Hispanic populations, younger generations of non-Hispanics in the United States seem to be learning Spanish in larger numbers due to the growing Hispanic population and increasing popularity of Latin American movies and music performed in the Spanish language. A 2009 American Community Survey conducted by the United States Census Bureau, showed that Spanish is the primary language spoken at home by over 35 million people aged 5 or older, making the United States the world's fifth-largest Spanish-speaking community, outnumbered only by Mexico, Spain, Colombia, and Argentina. French, the fourth most-common language (when Chinese dialects are combined), is spoken mainly by the Louisiana Creole, native French, Cajun, Haitian, and French-Canadian populations. It is widely spoken in Maine, New Hampshire, Vermont, and in Louisiana, with notable Francophone enclaves in St. Clair County, Michigan, many rural areas of the Upper Peninsula of Michigan and the northern San Francisco Bay area. Three varieties of French developed within what is now the United States in colonial times: Louisiana French, Missouri French, and New England French (essentially a variant of Canadian French). French is the second de facto language in the states of Louisiana (where the French dialect of Cajun predominates) and Maine. 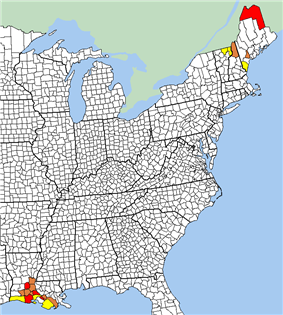 The largest French-speaking communities in the United States reside in Northeast Maine; Hollywood and Miami, Florida; New York City; certain areas of rural Louisiana; and small minorities in Vermont and New Hampshire. Many of the New England communities are connected to the dialect found across the border in Quebec or New Brunswick. More than 13 million Americans possess primary French heritage, but only 2 million speak French or French Creole at home. German was a widely spoken language in some of the colonies, especially Pennsylvania, where a number of German-speaking religious minorities settled to escape persecution in Europe. Another wave of settlement occurred when Germans fleeing the failure of 19th Century German revolutions emigrated to the United States. A large number of these German immigrants settled in the urban areas, with neighborhoods in many cities being German-speaking and numerous local German language newspapers and periodicals established. German farmers also took up farming around the country, including the Texas Hill Country, at this time. The language was widely spoken until the United States entered World War I. Over 2.6 million Americans speak some variety of Chinese, making it the third most-spoken language in the country. Until the late 20th century, Yue dialects including Taishanese and Cantonese were the most common among immigrants or the descendants of immigrants, especially in California. Since the opening of the People's Republic of China, Standard Chinese (Mandarin), the official language in the PRC and Taiwan, has become increasingly prevalent. Many young Americans not of Chinese or Taiwanese descent have become interested in learning Mandarin. Tagalog speakers were already present in the United States as early as the late sixteenth century as sailors contracted by the Spanish colonial government. In the eighteenth century, they established settlements in Louisiana, such as Saint Malo. After the American annexation of the Philippines, the number of Tagalog speakers steadily increased, as Filipinos began to migrate to the U.S. as students or contract laborers. Their numbers, however, decreased upon Philippine independence, as many Filipinos were repatriated. Today, Tagalog, together with its standardized form Filipinos are the second largest Asian ethnic group in the United States, Tagalog is the second most spoken Asian language in the country. Taglish, a form of code-switching between Tagalog and English, is also spoken by a number of Filipino Americans. Orange County, California is home to the largest concentration of ethnic Vietnamese outside Vietnam, especially in its Little Saigon area. Other significant Vietnamese communities are found in the metropolitan areas of San Jose, Houston, Seattle, Northern Virginia, and New Orleans. Similarly to other overseas Vietnamese communities in Western countries (except France), the Vietnamese population in the United States was established following the Fall of Saigon in 1975 and communist takeover of South Vietnam following the Vietnam War. The Italian language and its various dialects has been widely spoken in the United States for more than one hundred years, primarily due to large-scale immigration from the late 19th century to the mid 20th century. In addition to Standard Italian learned by most people today, there has been a strong representation of the dialects and languages of Southern Italy amongst the immigrant population (Sicilian and Neapolitan in particular). As of 2009, though 15,638,348 American citizens report themselves as Italian Americans, only 753,992 of these report speaking the Italian language at home (0.3264% of the population). Arabic is spoken by immigrants from the Middle East as well as many Muslim Americans. The highest concentrations of native Arabic speakers reside in heavily urban areas like Chicago, New York City, and Los Angeles. Detroit and the surrounding areas of Michigan boast a significant Arabic-speaking population including many Arab Christians of Lebanese, Syrian, and Palestinian descent. Arabic is used for religious purposes by Muslim Americans and by some Arab Christians (notably Catholics of the Melkite and Maronite Churches as well as Rum Orthodox, i.e. Antiochian Orthodox Christians). A significant number of educated Arab professionals who immigrate often already know English quite well, as it is widely used in the Middle East. Lebanese immigrants also have a broader understanding of French as do many Arabic-speaking immigrants from North Africa. Cherokee is the Iroquoian language spoken by the Cherokee people, and the official language of the Cherokee Nation. Significant numbers of Cherokee speakers of all ages still populate the Qualla Boundary in Cherokee, North Carolina and several counties within the Cherokee Nation of Oklahoma, significantly Cherokee, Sequoyah, Mayes, Adair, and Delaware. Increasing numbers of Cherokee youth are renewing interest in the traditions, history, and language of their ancestors. Cherokee-speaking communities stand at the forefront of language preservation, and at local schools all lessons are taught in Cherokee and thus it serves as the medium of instruction from pre-school on up. Also, church services and traditional ceremonial "stomp" dances are held in the language in Oklahoma and on the Qualla Boundary in North Carolina. There has been a Dutch presence in America since 1602, when the government of the Republic of the Seven United Netherlands chartered the Dutch East India Company (Vereenigde Oostindische Compagnie, or VOC) with the mission of exploring for a passage to the Indies and claiming any uncharted territories for the Dutch republic. In 1664, English troops under the command of the Duke of York (later James II of England) attacked the New Netherland colony. Being greatly outnumbered, director general Peter Stuyvesant surrendered New Amsterdam, with Fort Orange following soon. New Amsterdam was renamed New York, Fort Orange was renamed Fort Albany. Dutch city names can still be found in New York's neighbourhoods. Harlem is Haarlem, Staten Island is Staten Eiland and Brooklyn refers to Breukelen. Around 136,000 people in the United States still speak the Dutch language at home today. They are concentrated mainly in California (23,500), Florida (10,900), Pennsylvania (9,900), Ohio (9,600), New York (8,700) and Michigan (6,600) (i.e. the city of Holland). Shortly after the Civil War, many Finnish citizens immigrated to the United States, mainly in rural areas of the Midwest (and more specifically in Michigan's Upper Peninsula). Hancock, Michigan, as of 2005, still incorporates bi-lingual street signs written in both English and Finnish. Americans of Finnish origin yield at 800,000 individuals, though only 26,000 speak the language at home. There is a distinctive dialect of English to be found in the Upper Peninsula, known as Yooper. Yuper often has a Finnish cadence and uses Finnish sentence structure with modified English, German, Swedish, Norwegian, and Finnish vocabulary. Notable Finnish Americans include Gus Hall, U.S. Communist Party leader, Renny Harlin, film director, and the Canadian-born actress Pamela Anderson. Another Finnish community in the United States is found in Lake Worth, Florida, north of Miami. The Russian language is frequently spoken in areas of Alaska, Los Angeles, Seattle, Spokane, Miami, San Francisco, New York City, Philadelphia, Woodburn, Oregon, and Chicago. The Russian-American Company used to own Alaska Territory until selling it after the Crimean War. Russian had always been limited, especially after the assassination of the Romanov dynasty of tsars. Starting in the 1970s and continuing until the mid-1990s, many people from the Soviet Union and later its constituent republics such as Russia, Ukraine, Belarus, and Uzbekistan have immigrated to the United States, increasing the language's usage in America. The largest Russian-speaking neighborhoods in the United States are found in Queens, Brooklyn, and Staten Island in New York City (specifically the Brighton Beach area of Brooklyn), parts of Los Angeles, particularly West Los Angeles and West Hollywood, parts of Philadelphia, particularly the Far Northeast and, parts of Miami like Sunny Isles Beach. There are many Indians in the USA, and they speak various Indian languages. Major Indian languages spoken in the USA include:Telugu ,Tamil, Gujarati, Hindi (over 500,000 people) Punjabi and Marathi . Up to 37 million Americans have Irish ancestry, many of whose ancestors would have spoken Irish. According to the 2007 American Community Survey, 22,279 people speak Irish at home. As of 2008 it was the 76th most spoken language in the USA. Between 1981 and 1985 about 150,000 Cambodians resettled in the United States. Before 1975 very few Cambodians came to the United States. Those who did were children of upper-class families sent abroad to attend school. After the fall of Phnom Penh to the communist Khmer Rouge in 1975, some Cambodians managed to escape. In 2007 the American Community Survey reported that there were approximately 200,000 Cambodians living in the United States, making up about 2% percent of the Asian population. The Polish language is very common in the Chicago metropolitan area. Chicago's largest white ethnic groups are those of Polish descent. The Polish people and the Polish language in Chicago have been very prevalent in the early years of the city, as well as the progression and economical and social development of Chicago. Poles in Chicagoland make up one of the largest ethnically Polish population (650,000 people) in the world comparable to the city of Wrocław, the fourth largest city in Poland. That makes it one of the most important centres of Polonia and the Polish language in the United States, a fact that the city celebrates every Labor Day weekend at the Taste of Polonia Festival in Jefferson Park. The first Portuguese speakers in America were Jews who had fled the Inquisition; they founded the first Jewish communities, two of which stiil exist: Congregation Shearith Israel in New York and Congregation Mikveh Israel in Philadelphia. However, by the end of the 18th century the use of Portuguese had been replaced by English. In the late 19th century, many Portuguese, mainly Azoreans and Madeirans, immigrated to the United States, establishing in cities like Providence, Rhode Island, New Bedford, Massachusetts, and Santa Cruz, California. Many of them also moved to Hawaii during its independence. In the 17th and 18th centuries, tens of thousands of Scots from Scotland, and Scots-Irish from the north of Ireland arrived in the American colonies. Today, an estimated 20 million Americans are of Scottish ancestry. The province of Nova Scotia, Canada was the main concentration of Scottish Gaelic speakers in North America (Nova Scotia is Latin for New Scotland). According to the 2007 American Community Survey, 1,445 people speak Scottish Gaelic at home. Up to two million Americans are thought to have Welsh ancestry. However, there is very little Welsh being used commonly in the USA. According to the 2007 American Comminty Survey, 2,285 people speak Welsh at home; primarily spoken in California (415), Florida (225), New York (204), Ohio (135), and New Jersey (130). Some place names, such as Bryn Mawr in Chicago and Bryn Mawr, Pennsylvania (English: Big Hill) are Welsh. Several towns in Pennsylvania, mostly in the Welsh Tract, have Welsh namesakes, including Uwchlan, Bala Cynwyd, Gwynedd, and Tredyffrin. Yiddish has a much longer history in the United States than Hebrew. It has been present since at least the late 19th century and continues to have roughly 148,000 speakers as of the 2009 American Community Survey. Though they came from varying geographic backgrounds and nuanced approaches to worship, immigrant Jews of Eastern Europe and Russia were often united under a common understanding of the Yiddish language once they settled in America, and at one point dozens of publications were available in most East Coast cities. Though it has declined by quite a bit since the end of WWII, it has by no means disappeared. Many Israeli immigrants and expatriates have at least some understanding of the language in addition to Hebrew, and many of the descendants of the great migration of Ashkenazi Jews of the past century pepper their mostly English vocabulary with some loan words. Furthermore, it is definitely a lingua franca alive and well among Orthodox Jewry (particularly hasidic Jewery), particularly in Los Angeles, Miami and New York. Chinuk Wawa (or Chinook Jargon) is a Creole language of 700–800 words of French, English, Cree and other Native origins. It is the old trade language of the Pacific Northwest. It was used extensively among both European and Native peoples of the old Oregon Territory, even used in place of English at home for many families. It is estimated that around 250,000 people spoke it at its peak and it was last used extensively in Seattle. Louisiana Creole French is a French Creole language spoken by the Louisiana Creole people of the state of Louisiana, close to Haitian Creole, Colonial French and Cajun French (language of Acadians deportated from New France after 1755 and the Grand Dérangement). French Creole is spoken by millions of people worldwide, mainly in the United States and Indian Ocean areas. Pennsylvania German is a language that traditionally was spoken mainly in Pennsylvania, but that since the 19th century has spread to the Midwest (Ohio, Indiana, Iowa and other states), where the majority of speakers live today. It evolved from the German dialect of the Palatinate brought over to America by the Pennsylvania Dutch people before 1800. Originally spoken by adherents of different Christian denominations (Lutherans, Mennonites, Amish, German Baptists, Catholics) today it is mainly spoken by Amish and Old Order Mennonites. Another dialectal isolate is that spoken on Tangier Island, Virginia located in the Chesapeake bay. The dialect is partially derived from English as spoken by English pre-Revolutionary settlers, and partially from the present-day Middle-Atlantic American dialect of English. It also contains some words from the Cornish Language, the Celtic language spoken in Cornwall in southwest England. ^ "Census Data Of USA". US Census Bureau. Retrieved 17 August 2012. ^ "Senate Amendment 1151 to Senate Bill 1348, Immigration Act of 2007". project Vote Smart. Retrieved 2008-07-04. ^ "Selected Social Characteristics in the United States: 2007". United States Census Bureau. Retrieved 2008-10-09. ^ Byrd, Mary Lou. "Three States Consider Making English Official Language". The Washington Free Beacon. ^ a b c d e f g h i j k l m n o p q r s t u v w x y z aa ab ac ad ae af ag ah ai aj ak al am an ao ap aq ar as at Crawford, James (June 24, 2008). "Language Legislation in the U.S.A.". languagepolicy.net. Retrieved April 27, 2011. ^ "Once forbidden, Alaska’s Native languages now official state languages". KTOO. October 24, 2014. Retrieved October 25, 2014. ^ "Keetoowah Cherokee is the Official Language of the UKB". http://keetoowahcherokee.org/. Keetoowah Cherokee News: Official Publication of the United Keetoowah Band of Cherokee Indians in Oklahoma. April 2009. Retrieved 1 June 2014. ^ "UKB Constitution and By-Laws in the Keetoowah Cherokee Language (PDF)". http://www.keetoowahcherokee.org/. United Keetoowah Band of Cherokee Indians. Retrieved 2 June 2014. ^ a b c d "The Cherokee Nation & its Language". University of Minnesota: Center for Advanced Research on Language Acquisition. 2008. Retrieved 2014-05-22. ^ "Samoa now an official language of instruction in American Samoa". Radio New Zealand International. 2008-10-03. Retrieved 2011-04-28. ^ Crawford, James. "Puerto Rico and Official English". languagepolicy.net. Retrieved April 27, 2011. ^ "Frequently Asked Questions". visitusvi.com. United States Virgin Islands. Retrieved April 27, 2011. ^ Some have asserted that the New Mexico situation is part of the provisions in the 1848 Treaty of Guadalupe Hidalgo; however, no mention of "language rights" is made in the Treaty or in the Protocol of Querétaro, beyond the "Mexican inhabitants" having (1) no reduction of rights below those of citizens of the United States and (2) precisely the same rights as are mentioned in Article III of the Treaty of the Louisiana Purchase and in the Treaty of the Florida Purchase. This would imply that the legal status of the Spanish language in New Mexico and in non-Gadsden Purchase areas of Arizona is the same as of French in Louisiana and certainly not less than that of German in Pennsylvania. ^ "Más 'speak spanish' que en España". Retrieved 2007-10-06. ^ Ammon, Ulrich; International Sociological Association (1989). Status and Function of Languages and Language Varieties. Walter de Gruyter. pp. 306–308. ^ a b Thompson, Irene (6 August 2013). "Cherokee". http://aboutworldlanguages.com/. http://aboutworldlanguages.com/. Retrieved 22 May 2014. ^ Eric L. Friedland. "Hebrew Liturgical Creativity in Nineteenth-Century America". Oxford University Pres. Retrieved 20 December 2013. ^ "Brandeis University Study Finds that American-Jewish Population is Significantly Larger than Previously Thought". February 2, 2007. Retrieved 30 November 2013. ^ "Language Use in the US 2006–2008 (850k Excel file!)". US Census Bureau. Retrieved 23 June 2011. ^ Joshua A. Fishman (1991). "Appendix: The Hebrew Language in the United States". Yiddish: turning to life. John Benjamins Publishing Company. pp. 148–159. ^ a b Lewis, M. Paul; Gary F. Simons, and Charles D. Fennig (eds.) (2013). "American Sign Language". Ethnologue: Languages of the World, Seventeenth edition. SIL International. Grimes, Barbara F. (Ed.). (2000). Ethnologue: Languages of the world, (14th ed.). Dallas, TX: SIL International. ISBN 1-55671-106-9. Online edition: http://www.ethnologue.com/ accessed on December 7, 2004.